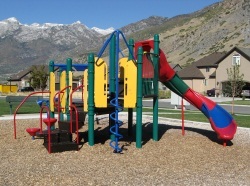 Highland City has a total of 15 children's playground areas. Highland City has two certified playground safety inspectors who inspect and maintain playgrounds. Playground equipment is inspected on a weekly basis and audited annually. Most playgrounds are filled with ADA-approved soft fall (bark) that must be raked back on a monthly basis, including areas underneath slides. All of our children’s playgrounds are used daily, especially during the spring and summer months.